I was introduced to the Harry Potter series sometime before this book was released. The woman who would become my high school biology teacher bought me the first book, and I read the following two in short order. 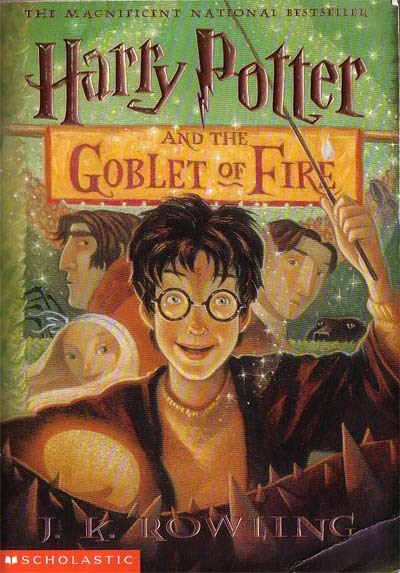 The Goblet of Fire was the first novel I'd ever waited for with anticipation, the first novel I'd ever ordered on Amazon (with my mother's credit card if I'm remembering correctly), and the first novel longer than a Goosebumps book that I read in less than 48 hours. I believe this is my third or fourth reading of the novel, but my first after taking up the keyboard to be an author myself. I'll attempt to make my thoughts on it vague enough that I won't spoil the story for you, but I'm assuming you've at least read the first three novels. If not, you may as well stop reading here. In book 3, Rowling began the transition from middle-grade author to YA author. I would place this story as the first novel of the second half of Harry Potter's story. The wizarding world is normalized and expanded. Harry's relationship with the established order of his world has shifted from pre-adolescence to teenaged. We see that Harry, Ron, and Hermione find themselves with crushes and the need to rebel against social constructs that they deem unjust (more on that in a second). There is a darker tone to this story. It starts with a prologue, away from Harry's perspective for the first time since the first novel. The introduction establishes the story's darker direction, informing the reader that we've moved away from innocent adventure and into a world that's profoundly more dangerous. During the story, we get a taste of the darker side of magic when we're introduced to the new Defense Against the Dark Arts teacher. We also see wizards from different communities, wizards with different sets of values, and learn more about the adult wizarding world. A large portion of the novel takes place before Harry even arrives at school, leaving his Hogwarts adventures to occupy the latter two-thirds of the story. This isn't due to poor pacing, but rather Harry's first exposure to the larger wizarding world. After Harry arrives at Hogwarts, he engages in several fantastic action/adventure set-pieces. They're well paced throughout the story, giving Harry time between each to explore a few side stories and prepare for the next adventure. Rowling's use of Hermione's SPEW story is flimsy at best. Though there could be an underlying message about responsible advocacy, I have to reach far to spin it this way. At first blush, it appears to be making light of something that's potentially very sensitive, especially for American readers from certain backgrounds. Despite that weakness, this remains top-shelf for me. Rowling crafted a story that successfully prepares us for the last three books in Harry's story while keeping us entertained and curious throughout.